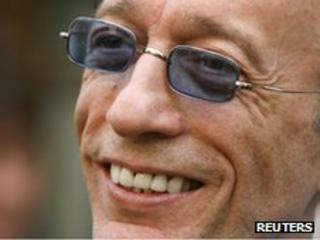 Robin Gibb funeral "for close family and friends"
A private funeral for the late Bee Gees singer Robin Gibb will take place next week, with a public memorial service planned for later in the year. The funeral, on Friday 8 June, will be "a private service for close family and friends", a statement said. The family requested that those attending offer donations, rather than flowers, to two children's charities on the Isle of Man, where Gibb was born. Gibb died on 20 May, at the age of 62, after a long battle with cancer. All four Gibb brothers were born in the Isle of Man and although the family soon moved to Manchester, Robin later bought a home in the west of the island, near Peel, where he and his wife Dwina spent holidays. Sir Miles Walker, chairman of the Isle of Man children's hospice Rebecca House - one of the potential beneficiaries - said: "You never really think people as famous as Robin would remember a hospice in the Isle of Man. "To think that through all this difficulty the family have made this gesture, well, I don't know, words fail me - I just think it is so generous." No location has been given for the funeral. Over a period of 40 years, Robin - alongside twin brother Maurice and older brother Barry - racked up a string of hit singles including Jive Talkin, Stayin' Alive and Massachusetts. Fellow Bee Gee Maurice Gibb died in 2003, and solo star Andy Gibb died at age 30 in 1988, leaving Barry Gibb as the last surviving sibling.